Misty weather makes things look interesting and mysterious, I really like misty weather. We had it misty today, and that all day long. I grabbed my camera in the afternoon one hour before it gets dark, because I thought I could take some mysterious photos along one of the paths near a big pond. I shot several photos, but I really like the one you can see in this post. When my aunt saw the photo, she said “I wouldn’t have walked there in the mist, because it looks creepy”, and I laughed and replied “Well, I am glad you think it looks creepy, because that is something I wanted to capture when I decided to go walking in the mist”. For some reason I do think about the medieval or earlier times when I look at the photo, I’d like to see more foliage on the ground and a less distinct path, and I’d like to see a convoy of people and horses walking along the path, that would be a nice scene. If this would be a movie scene, I would now expect that enemies come out of the bushes on the right side, to attack the convoy. To be honest, my imagination is probably a little bit inspired by a historical event, the battle of the Teutoburg Forest, where Germanic tribes ambushed and decisively destroyed three Roman legions. I have read about it, I have watched documentaries about the event, and I played through this scenario in a PC game called “Rome: Total War”. Of course, ambushes were common back then, and I know them from all kind of historical movies. An ambush would have worked extremely well at the place where I took the photo, because there is no escape due to the pond on the left side. I like to find out if places or photos remind me of something, I like see what my imagination is. Even without bloodshed it is a very beautiful shot. Could easily linger here for a few moments and stay lost in that 🙂 Beautiful. You are very welcome – my pleasure! This photo is full of atmosphere and I can see why your aunt found it creepy but it is also beautiful in a stark way. The mist does add to the atmosphere. I like to take pictures in the mist too during the winter. 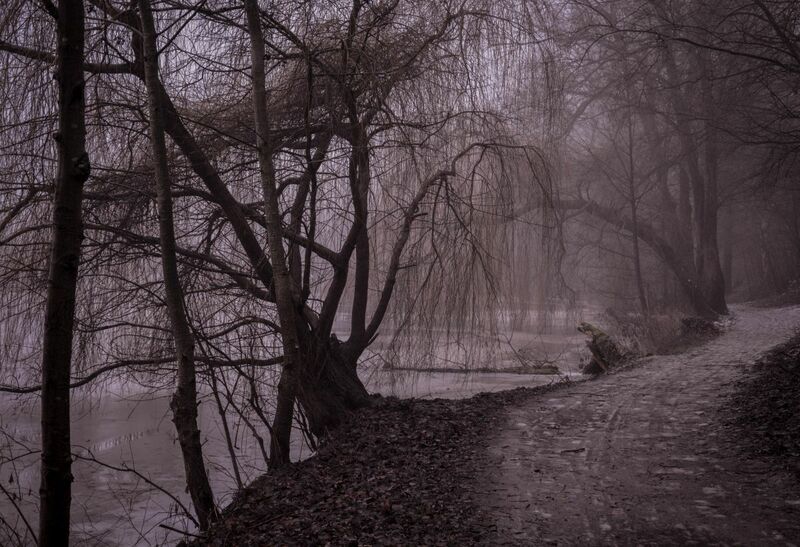 Thanks Vanda, it was amazing to walk along the paths during the misty winter weather. I expected that it would be difficult to take photos due to the low light, but it was not difficult at all. I enjoyed the atmosphere a lot, it’s the type of weather I do like. Gorgeous shot. And creepy indeed haha.